Few athletes in the history of Italian sports rose to glory with the aura of Fausto Coppi. A silent and slender man from Piemonte, in the North West of Italy, Fausto won the Giro d’Italia in 1939, just before the war stopped his career. Enrolled in the army, he fought in Africa and after the battle of El Alamein became a prisoner in an English war camp. In 1944 the English Army brought Coppi’s group of prisoners to Naples, in the South of Italy, and then to nearby Caserta. Fausto, who was born in 1919 and at 26 still had the best in front of him, had not ridden a bicycle for at least 3 years, but when he got there, the rumors of his presence spread quickly. Giuseppe D’Avino, a local carpenter who owned a Legnano bike, the same brand Fausto ran for before the war, went to the prison camp and asked Col. Towel, who directed it, to give Coppi the bike to allow him to train again. Fausto became a friend of D’Avino and thanked him in the following years when the Giro took place in Campania by going to meet him. The champion burnt with the desire to test himself. After competing in some local races for the Lazio squad, he decided, when he was freed, that it was time to go back to Castellania, his village, get married, and be a professional cyclist again. Fausto’s first competition like the Giro or Tour was actually his return home. In the summer of 1945 he rode Mr D’Avino’s bicycle from Caserta to Castellania, in a devastated country. About 800 km in a week, stopping where he found somebody willing to host him, eating where the people shared their food with him. Now, all that is told about Fausto Coppi in Italy is halfway between reality and legend. A tragic figure, although marked by greatness, Fausto belongs to that group of stars who rose to glory in the aftermath of the end of WWII, only to die young and have his legend carved in stone. Like him, the Grande Torino team in Italy, the legendary French boxer Marcel Cerdant, Edith Piaf’s husband, and Manchester United team in 1958. When the competition restarted, Fausto lost the Giro against Bartali in 1946, but soon after he dominated. He didn’t participate the Tour in 1947, like all the Italians, and in 1948, due to the quarrel with Bartali that triggered the Walkenburg disaster (when, at the world championship, the two fought so much against each other that the Italian team failed completely and they were disqualified). In 1949, after dominating the Giro (winning a legendary stage: the Cuneo Pinerolo, with 11 minutes of advantage on Bartali), Coppi was ready for the Tour. Alfredo Binda, the World Champion of the 30s and multiple Giro d’Italia winner, a strong man with good diplomacy, sat Gino and Fausto around a table, telling them clearly, what the tactic would be and agreeing with them the objectives of the Italian team. In the first stages Fausto lost time due to his misfortune: he fell, broke the bicycle and had to wait for Binda to come. Then, in the first time stage, 92 km in La Rochelle, Faust won and started to come back. Coppi won both stages on the Alps, and lead the race. His last victory of that Tour, the time stage from Colmar to Nancy, of 137 (!) km, sealed his first final yellow jersey. Fausto did much more: he won Giro and Tour in the same year, like only the greatest. Anquetil (2 times), Merckx (3), Hinault (2), Roche (1), Indurain (2) and Marco Pantani (1), are the others. In 1950 he broke his hip in the first months of the season and lost the year. Misfortune began to strike him again, it seemed that the more he won, the more he had to endure. In 1951 he broke his clavicle but managed to come back and run a good Giro, finishing 4th. But the worst had yet to happen. On June 29, 1951, his brother Serse, at the Tour of Piedmont, in Turin, fell from the bike because the front wheel got stuck in the railroad. The doctors said he was ok, but in the evening in the hotel, he lost his senses and died of a brain hemorrhage. Fausto was destroyed, Serse was his little brother, he managed to have him in his team and helped him win the Paris Roubaix in 1949. Fausto ran the Tour anyway. He did some good stages, but was not at his best and finished 10th. His second great Tour came in 1952, after he earnt another Giro. Here, Fausto won the 7th stage, a chrono, and dominated the rest of the race. On the Izoard, Fausto and Gino Bartali climbed up together, and Fausto had a bottle of water in his hand, given by a spectator. He poured water on his face and then gave the bottle to Gino. That photo, published on the Italian newspapers, ignited discussions about who gave the bottle to who and why. The two names, Gino and Fausto, now more than cyclists, were living legends, parties and life philosophies. 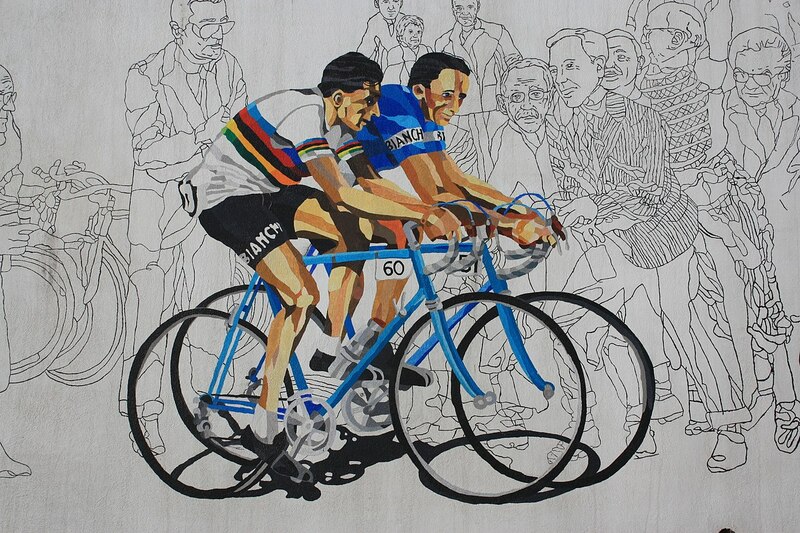 Coppi gained the Tour in a triumphal way, admired even by the French. “Fostò” was a perfect cyclist. On the bicycle he was elegant, fast, understood the race. His heart rate was 34 bpm when he rested. His lungs could inhale more than 7 liters of air. When he walked, he looked like a bird who’s not flying, but when he cycled, his perfect position, his head firm and the long arms stretched ahead of him made him look like a heron, as his nickname was. In 1953 Fausto won his last Giro and became World Champion in Zurich, after he already had been twice pursuit race champion. His last years saw a fast decline; at 34 he had given his best. His war years claimed a toll on himself. He still won some races, but not the important ones. He divorced his wife and married Giulia Occhini, “the white lady” as the magazines called her, he had fallen in love with around 1948. Divorce was still not legal in Italy, so he had to go to Argentina to remarry, and this was probably Italy’s biggest scandal of the 50s. He was still a legend, beloved, idolized. He shared with Gino Bartali the burden of being the great champion of the years after the war. That is why, at the end of 1960, when he fell sick after a trip to Africa, in which the malaria, latent since he had been a prisoner in the war camp in 1944, struck him again, all of Italy participated in his mysterious illness. The Italian doctors did not recognize it, and Fausto died after a terrible agony on January 4 1961. Thousands of people participated in his funeral. A period of Italy, an age of innocence died with him. Everybody has his “Coppi memory”, if he lived in those times: saw him somewhere, and lived with the reminiscence of this man, whom the invisibility of the radio and the voices of the great journalists of the time, like Antonio Ferretti, brought to life with the poetry of their descriptions, often stronger than the real images themselves. A legend, as the great sportsmen of the time, built on an oral narration, grown up invisibly from the radio, and fed constantly by the need of the people to cheer somebody who was great and could lighten the burden of a hard life with the dream of these men’s invincibility. And that is why his death, so young, made such a great impression.